30 years ago this month, Bradford City made unwelcome history when they played their first ever home match in Bradford that wasn’t held at Valley Parade. Brighton & Hove Albion were the opponents for a League Cup tie; Odsal stadium was the venue, home to Bradford Northern (now the Bulls). A 2-0 defeat was hardly the most encouraging of starts to City’s life at their temporary home. Just 5,368 people turned up, with a torrential downpour ensuring they returned home cold and soggy. The Bantams would spend 14 months playing home matches at Odsal. Their exile three miles up the road was due to Valley Parade getting rebuilt, following the tragic events a few months earlier that saw fire engulf the main stand during the final game of the 1984/85 season, with 54 City supporters and two Lincoln fans losing their lives. For the first few weeks of the following season, City staged games at Huddersfield Town’s Leeds Road and Leeds United’s Elland Road. But there was a huge will to keep Bradford City in Bradford, as the city came to terms with the awful tragedy that had befallen its professional football club. So Odsal became Bradford City’s temporary home, even though it quickly became unpopular with the City management team, players and supporters. The vast bowl was too big for City’s requirements, and the atmosphere was poor. The lack of cover from the weather severely tested even the hardiest of souls during winter. It wasn’t a football venue. Valley Parade’s redevelopment took place at a slower rate than expected, but eventually in December 1986 City returned their true home, with an England XI the opponents for the grand reopening. 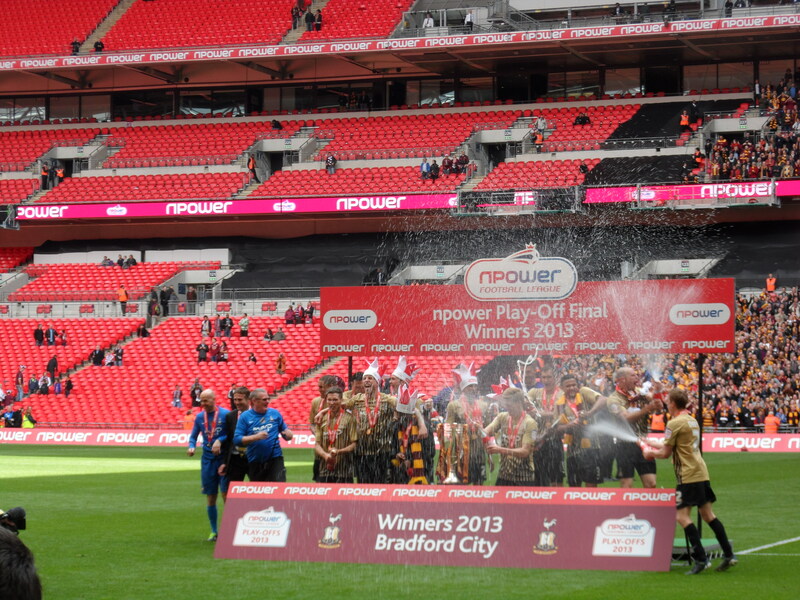 Such extraordinary events set the tone for the remarkable modern history of Bradford City. Whereas the club had experienced glory days in the 1910s – winning the FA Cup and becoming one of the country’s top teams – for decades after they remained rooted to the bottom divisions, in a largely mundane existence. Prior to the Fire Disaster, that trend was starting to be reversed with two promotions achieved during the first half of the 80s. Rarely has there been a dull moment since. In 1988, City almost tasted top flight football for the first time in 66 years, only to miss out on promotion in controversial circumstances. It took years to get over the disappointment and the club drifted again; before the ambitious Geoffrey Richmond took charge and ruthlessly drove them into the Premier League. Crowds quadrupled over a short period of time, legends were made. But then Richmond gambled on the club’s future and lost spectacularly, prompting a painful decade of relegations and financial uncertainty that threatened its very existence. The wilderness years were only ended by the inspired appointment of Phil Parkinson in 2011; and he is now leading City back up the football ladder, whilst engineering some of the most spectacular cup upsets English football has ever known. It has been some 30 years. And the story of Bradford City’s modern history is the subject of an upcoming book – written by myself – titled ‘Reinventing Bradford City’. The book looks at the major events that have occurred since 1986, centred around 12 key matches from the modern era. Whilst the games I have chosen to write about include celebratory events like the Blackpool play off win in 1996, promotion to the Premier League at Wolves in 1999 and last season’s astonishing FA Cup victory at Chelsea, there are also chapters about the darker moments. The infamous Ipswich game of 1988 and the fall down the leagues in the 2000s are included, for example. The idea is to cover the full range of moods and emotions that have shaped the Bantams’ since 1986. Reinventing Bradford City retells these stories through the eyes of the people who witnessed them first-hand. The book features interviews with players, managers, directors, journalists and fans. Collectively, their views help to build up a picture of just how much Bradford City has evolved through modern times. Just as Valley Parade has witnessed so much drama over the past 30 years, English football itself has never experienced such an eventful period. Part of the story of City’s last 30 years is that of finding their place in the modern game. Of the lost opportunity of establishing the club in the top flight before the Premier League riches began to create a divide between the have and have nots; and of how Richmond later attempted to secure a lasting place at the top table more than a decade later, only for it to go wrong so painfully. More recently, you could make a strong argument that City are the country’s heroes, at least to those who feel negative about the way modern football has shaped itself. The cheap season tickets go against the sport’s trend of eye-watering admission prices, and the cup giant killings of Arsenal, Chelsea and co were all-to-rare moments of a little club socking it to the over-bearing Premier League. By writing about these 12 matches from across those 30 years, I aim to show how Bradford City has continued to change and reinvent themselves. Reinventing Bradford City is due to be published in March 2016 by Bantamspast Publishing. It is the follow up to the highly acclaimed A History of BCAFC in Objects by John Dewhirst – the second in a series of books offering fresh perspectives on the history of Bradford football and challenging the traditional version of events. Although next March is five months away, you can pre-order your copy now and, in return, subscribers will get their name printed within the book. By pre-ordering you can also class it as a Christmas present to the City fanatic in your life. Reinventing Bradford City is the second volume in the new series, HISTORY REVISITED and the sequel to the highly acclaimed first volume, A HISTORY OF BCAFC IN OBJECTS by John Dewhirst which was published last year. There are two further volumes planned in the series. The third, ROOM AT THE TOP tells the nineteenth century rivalry between the Valley Parade and Park Avenue clubs and the fourth, WOOL CITY RIVALS continues with the twentieth century narrative. Both are being written by John Dewhirst. Between them the four volumes will tell the story of football in Bradford from its genesis to the modern day and the series is intended to provide a definitive history. There will be subscriber and limited edition hard back issues of each. Great news – how and where do we pre-order though? Thanks for your kind words. If you email the following address to register your interest that would be great. Shouldnt the email address read glorious1911@paraders.co.uk ? Whilst the email address should be as you state, the reason it wasn’t is that otherwise it inevitably results in a deluge of spam emails. If anyone can other a better solution than stating it online as dot this or dot that please advise! We are excited by this project and the production of a series of books that will provide a definitive history of Bratfud football from its origins to the present day. This period of City’s history resonates hugely, but i think the roots of the roller coaster 30 years were sown by George Mulhall. Ok we stuttered to a brief and ignominious one season in division 3 but for me that was a bit of a spark, albeit one that didn’t light. However I remember the optimism (it did fade quickly) when we were relegated of a quick return. Yes, we had a couple of years of hopeless drifting culminating in an utterly dreadful final game of 1980/81 at home to Hereford. How Roy McFarland was persuaded to take the helm I will never know, but he did and the rest, as they say, is history. 1981/82 was, and remains in my mind, a very memorable season. The football was exciting, there were goals a plenty (who can forget the 5-1 home victory against Stockport in the snow with our 5 goals coming in the last 15 minutes?). And it was onwards and upwards from thereon. Wonderful memories, great times; so glad I have been part of the journey. Fantastic – can’t wait to read this !